Once upon a time, in a village, there were two neighbours. One lady was called Venkamma and the other Subamma. Venkamma was a rich lady and had more than ten buffaloes. Subamma was poor and had just one buffalo. One day Venkamma borrowed some milk from Subbamma. Days passed by but Venkamma did not return the milk. Subbamma asked her to give the milk back. Venkamma outright denied having borrowed milk from her. Venkamma said, ‘I’ve so many buffaloes. Why will I ask you for milk? Subamma then put forth a complaint to Ramanna who was known for being just. He sent for both of them. Both the women went to meet Ramanna. It had rained the night before so the ground was muddy. There were two buckets of water under the tree. Ramanna asked the women to wash the mud off their feet. Both the women washed their feet and came and stood in front of Ramanna. Venkamma was frightened to hear about the punishment and she agreed to return the milk that she had borrowed. People wondered how Ramanna declared the punishment without questioning. They asked him for a reason and he explained. 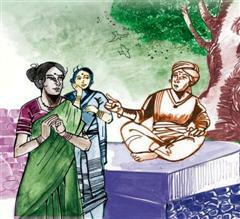 ‘When Venkamm and Subamma were washing their feet I observed them. Venkamma is a spendthrift. She poured all the water in the bucket on her feet but a lot of mud was still stuck on it. Subamma used only two mugs of water to wash her feet but cleaned it properly. So this shows that though Venkamma had more buffaloes, she still needed to borrow. Subamma had less but knew how to be careful. All the villagers praised Ramanna for his wisdom. We all believe that if we have things in large quantity, it is a sign of happiness. We don’t understand that we need to use our resources wisely and carefully. We will actually make our lives happier by doing that. If we keep on wasting the resources today, nothing will be left for tomorrow. So we should use resources as per our need. 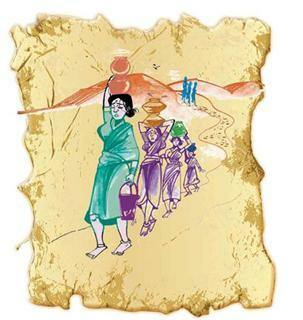 This story teaches us to use our limited resources wisely and enjoy peace and happiness.